Just so you know, there'll be no spoilers in my review. I'm not going to get into the plot of the book. But I will tell you how much I enjoyed it. So how do I start this thing. Well, maybe with a question. What do you get when you cross a 90 something pound, tattooed, computer-hacking, social outcast, misfit waif of a young woman with a somewhat womanizing yet earnest, best-selling investigative journalist? 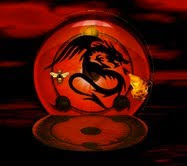 Well, you get an action-packed trilogy by Stieg Larsson comprised of The Girl With The Dragon Tatoo, The Girl Who Played With Fire and The Girl Who Kicked The Hornet's Nest - known collectively as The Millenium Series. The character Lisbeth Salander is quite the heroine. Thank god she's fictional. If she were real she'd be one mean mo-fo. How can I best describe her? She's an introverted, tattooed, brainy, rockin', punkish goth. Sorta like Quirkyloon. Ah, no I'm just kidding. Quirky's certainly no introvert and I'm not sure if she has any tattoos - if she did it wouldn't a dragon but it might be a zombie! I digress. You know the character Abby in NCIS? Okay, now think of Abby as the clean cut, appropriately dressed one of the family. Lisbeth is her polar opposite. I have to say that while the first of these stories has been around for some time I always thought these were "chick books", you know maybe like a new version of Harlequin Romance novels. Something womany, right? Boy, was I wrong. And I had no idea there was a trilogy or that each of these books has been made into a movie. It's hard to mention The Girl Who Played With Fire without mentioning the other two as the storyline carries across the three books. But thank God they're individual books. With each coming in at just over 600 pages can you imaging trying to carry the whole she-bang along in one volume to read every time you had to go to the toilet? The Girl Who Played With Fire is a "page turner" just like the other two. Primed by the first volume, I dove right into it and was done in a matter of days. With a background in journalism myself, I enjoyed how the storyline combined prying, comprehensive, investigative journalism techniques undertaken by main character Mikael Blomkvist with the computer-savvy, take-no-prisoners character he shares the novel with, Lisbeth Salander. I also enjoyed Blomkvist's approach to the ladies. He seemed to know just what his women's wants and desires were and just how to address them to their satisfaction, if you know what I mean. I don't mean to brag but he kinda reminded me of myself in that way. Hey, I pride myself on knowing when to turn down the volume on the football game or when to change my socks after a couple of days. I'm thoughtful and considerate like that. Anyway, the book weaves all this against an ongoing theme of social injustice vis-a-vis the treatment of women in society. And there's the matter of ethics, what's right and wrong, be it journalistic research, a police investigation, cold-war espionage, computer theft, revenge and retribution and, yes, even love. Larsson died of a heart attack at the age of 50, prior to these novels being published. It is said he left three-fourths of a fourth book on his computer and the synopses for a fifth and a sixth book which he intended to include in a total of ten books. How unfortunate his passing. If he had managed to complete the rest then I'd rush right out and snap them up. This book, indeed the series, has everything a lover of great stories is looking for. In fact I haven't read a collection of works like this since I read His Dark Materials, a trilogy of fantasy novels by Philip Pullman. You may know the first volume, The Golden Compass. So if you want a good read. Buy this book, or look it up at your library. Or, if you aren't in a hurry, hang on until it comes your way on the tour of The Bloggerhood Of The Traveling Book. In the meantime visit my fellow member of the Bloggerhood Of The Traveling Book, and the person responsible for the badge at the top of this post, 00dozo @ When I Reach, for her take on the book tomorrow. You promised no spoilers. Well, I didn't know 00dozo was a "she." (Where's the googly-eyed emoticon when you need it?) That's how with it I am. Ha! Nicely done Sir Nomie. But I have to DISagree with the likability of the womanizer Kalle F**cking Blomkvist. But I am a woman, and most women, last time I checked do not care to share our men. Erika Berger be damned! Unless you are a sister wife on TLC's newest reality hit: Sister Wives. I really should get some sort of compensation of all the tv plugs I give. UP: Of course that's not to say the book belongs in the toilet. Quirks: Yeah, that Berger/Blomkvist relationship was a tad odd. But it served to further illustrate Larsson's overall view of the treatment of women, don't you think. Lord you watch an awful lot of TV. You talk about shows I've never even heard of. Very well done, dufus!! All the reviews are great. 00dozo: Hell, are you Lisbeth, hiding out in the Bahamas? Everybody got her gender confused. Ironic, eh? Hey, I'm a day late getting here, but it was worth the wait! 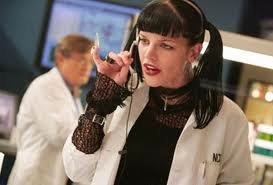 Love the comparison to Abby Sciuto... one of the best characters on television! Like Quirky, though, I'm not sure I'd want to share my naughty fun partner with other women... in the unlikely event that I ever find another naughty fun partner, I'm keeping him to myself! Oh, and I'm also glad Larsson divided up the story into three more manageable books... it's so difficult to carry those weighty tomes around when one is on crutches! But damn... why'd he have to go and die and leave us short 7 more novels about Lisbeth? Boom Boom: A day late? Oh, right, we have to account for your crutches. Oh and when I said Blomkvist reminded me of me, I didn't mean in a sharing kind of way. Geez, trying to please one lady's a full time job around here - vacuuming, dishes, making the bed. I make her happy by letting her do it all! And, hell, who else would put up with my stinky feet? It's really a shame that he went and died. His death and the books became quite a big thing over here when it happened. His parents and brother inherited the proceeds and rights to the books, but the fourth book, of which there is 320 pages written, is owned by Larsson's long time girlfriend who won't release it to be published. Then again, I'm happy he died after the third books was done, and not say, the second, because that would have really sucked. Anyway, great review. It's really difficult to describe Lisbeth Salander in less than 2.000 words, but you did a good job. Ziva: Glad you enjoyed the review. Thanks for the comment. I understand his girlfriend lost out on the royalties because they never married because of security concerns or some such thing. Too bad. She sure lost out. Oh, and I can barely churn out a couple of posts a week. Imagine having the creativity to write a 10 book series!